Lovely garnet hue with impressive aromas of bold red berries, a clear beam of dill with some smoke and spicy black cherry with strawberry fruit. Palate--Mouth watering acidity with integrated structure, and a perfumy mid-palate with a very metallicy almost "fishy" like accent. A day later this is a beautiful fully integrated, prime drinking Merlot with more woody, chocolate and mocha notes. 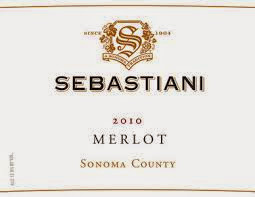 This is a luscious Merlot from the always outstanding wines of the famous Sebastiani family. This Sonoma wine runs for around $13 and it is a GREAT value so raise a glass!